HOT DOG DAYZ!!! 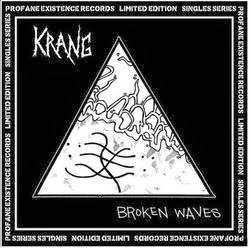 : Record Review: Krang - Broken Waves 7"
Record Review: Krang - Broken Waves 7"
I love the way this EP was recorded. Unfortunately the rhythm section gets buried a bit in the mix, but for the most part everything works really well. The guitar work is first-rate. Weighty thrash riffs are peppered with erratic fills and soaring leads for a searing assault on the senses. The vocals are a bleach-gargled exasperation of anger and misery, and redolent of the crustier side of black metal. Everything is amplified just enough to give it a really crunchy, unrestrained air of noise that perfectly encapsulates the hellish intersection of thrash metal and crust punk. ...Read full-length review after the leap.